Many of the earliest churches were built of wood, sometimes of logs in palisade form, covered with planks and roofed with thatch. But as soon as the means of the parishioners made it possible, they built more substantial churches of wooden framework, filled in with rubble, or with field stones and mortar, or of solid stone wall construction. 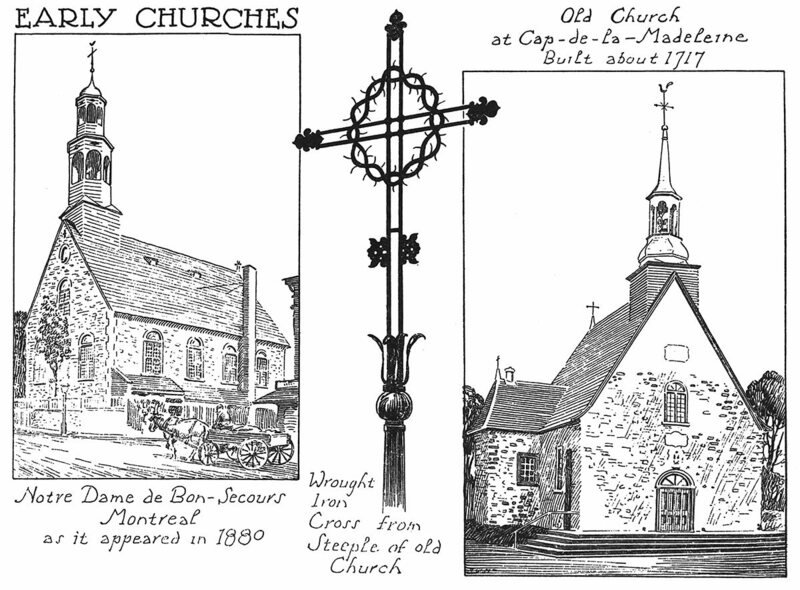 In 1681 there were only seven churches built of stone in the colony, besides those in the city of Quebec. All the others were of wood, in log or frame construction. Today there exist only about twenty churches which were built during the French regime, and nearly all of these have undergone considerable alteration. In some cases only their foundations can be assigned definitely to that period. The architectural style prevalent during the eighteenth century and well into the first half of the nineteenth was that of the late Renaissance, classic in origin and feeling, and sometimes referred to as Jesuit or Baroque. This was the contemporary style in France and throughout almost all Europe, and it is possible that some of the plans for Canadian churches were prepared in the mother country. 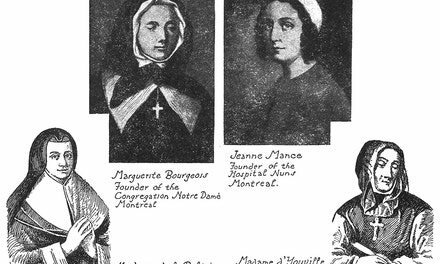 We know the names, however, of several architects, sculptors and church builders, natives of New France, such as Levasseur, Baillarge and Quevillon, in whose families the profession was carried on for two or three generations. The typical early French Canadian church was built to withstand a rigorous climate. The steep roofs shed the snow, the plain, flat walls without projecting ornament gave no lodgment to water, ice or snow. In general the churches fitted admirably into their landscape surroundings. Their beauty consists principally in their harmonious proportions, and the contrast between the massive simplicity of the building and the slender grace of the spires and open belfries. Fire was a constant menace to all wooden structures, especially in the days of primitive methods of heating. The early churches were not heated. Sometimes there was an open brazier with charcoal to warm the chancel, and the priest had to wear heavy woollen garments under his vestments, while the congregation carried various heating devices such as foot warmers into their seats. Sometimes a heated room was provided in the priest's house where the worshippers might warm themselves. Roofing was a problem for both houses and churches. Wooden shingles were a fire hazard. 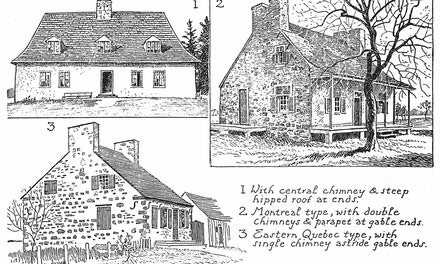 There was no satisfactory slate to be found in Canada, and tiles were expensive to manufacture, difficult to fasten on the steep roofs, and cracked under severe frost. A roof covering affording better fire protection was found in sheets of tin, which came into use probably as early as the middle of the eighteenth century. See Old Churches of the Province of Quebec, published by the Commission of Historic Monuments, Quebec, and monographs by Professor Ramsay Traquair, McGill University, Montreal, and Dr. Marius Barbeau, the leading authorities on early French Canadian building.